The motion of a system of interacting nonlinear charged oscillators is investigated numerically. Because of nonlinearity, the total collective electric field gives rise to a phasing effect—correlations in the phases of the oscillators. The consequence is superradiation—the enhanced spontaneous short-term emission of the energy stored in the oscillators. It is shown that the oscillations of the oscillators become stochastic because of the dipole-dipole interaction between them and their nearest neighbors. As a result, as the density of the oscillators increases, distant collective correlations are suppressed, superradiation ceases to be generated, and radiation is shielded in the medium. 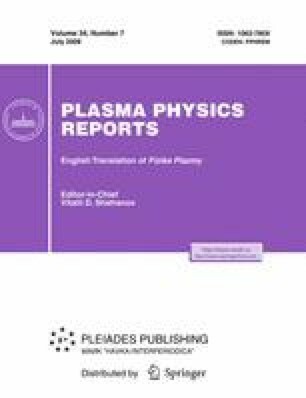 The phenomena considered in the present paper can play an important role in cyclotron emission from a plasma and thus should be taken into account in emission calculations. The process whereby the energy of the transverse electron motion in electron cooling devices decreases is analyzed as an example. This process occurs as a result of the development of cyclotron maser instability and has the nature of superradiation. The onset of correlations between individual electrons moving in their Larmor circles is the initial, linear stage of instability developing in the plasma. Superradiation is the final, nonlinear instability stage. Original Russian Text © V.V. Berezovsky, L.I. Men’shikov, S. Oberg, C.D. Latham, 2008, published in Fizika Plazmy, 2008, Vol. 34, No. 7, pp. 607–613.